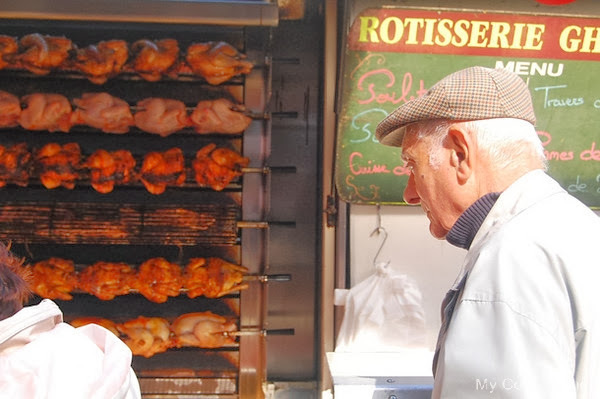 I've been thinking lately about the wonderful food that is prepared in France. This photo was my inspiration to make French Roasted Chicken. Julia Child has the best recipe in her cookbook Mastering The Art of French Cooking. But, I'm an easy, kinda fast cook. I like lots of free time while something is cooking. Being retired my sweetheart and I have a wonderful routine for preparing meals. We both love to cook. I cook dinner and he cooks the best breakfast. For lunch we usually snack on leftovers, some cheese, crackers and cold cuts or CHICKEN SALAD. The French Roasted Chicken was the best Sunday Dinner and all in one pan. After preparing the big bird for roasting I had a few hours to enjoy blogging and resting. Butter - The more the better! Preheat oven to 425 degrees F. Wash chicken in cold water and dry thoroughly. and rub the outside of the chicken with softened butter all over and season with salt and pepper. or on an oiled rack in a roasting pan in the oven. Roast for 15 minutes at 425 degrees F.
Remove chicken from oven. Reduce heat to 350 degrees F. Baste with pan juices and return to 350 degree F.
oven for 15 minutes. Remove from oven and add vegetables, such as carrots, onions, and potatoes, and baste again. Roast the chicken until the juices run clear. around 45 minutes, plus 7 minutes per pound. Remove the chicken, cover and let rest while preparing the gravy. Make gravy by adding broth and dried thyme on the stove top. Stirring constantly. Carve the chicken and serve with roasted seasonal vegetables. In my All-Clad roasting pan I turned the rack up-side down. The vegetables fit under the rack perfectly. I wanted all the buttery juices to drip down on the root vegetables in the bottom of the pan. Carrots, Potatoes, Celery, Onions and Turnips with salt and pepper. I hope you try My French Roasted Chicken sometime soon. 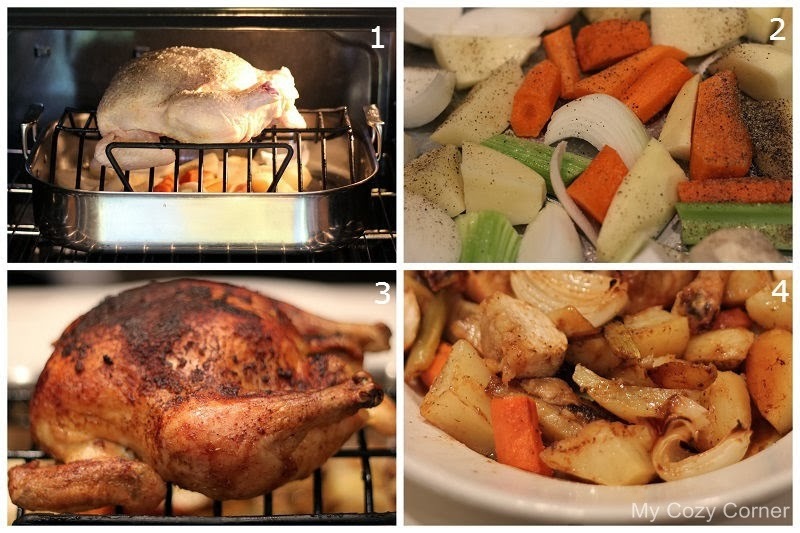 Your french-roasted chicken and the vegetables look delicious and quite easy to prepare. Thanks for sharing your recipe. Your chicken and veggies look delicious! It is a perfect meal for Sunday dinner. Thanks for sharing the recipe! Enjoy your week ahead! Your chicken dinner looks delicious and the house would smell marvellous as well. I want to try this as soon as we clear up our chicken crisis here in California. I am always looking for a better way to roast a chicken and this looks like the answer. Absolutely classic roasted chicken. I think I smell it. Thanks so much for sharing this recipe with us on foodie friday. There is nothing better in the fall than the smell of a chicken roasting in the oven. I just love that you have the vegetables on the lower part of the pan to catch every bit of goodness from the chicken. Thank you so much for sharing with Full Plate Thursday and hope you are having a great weekend! Just wanted you to know that your recipe is being featured today on Foodie Friday. Stop by and get your featured button. I will be pinning and tweeting it this week.